New book, 80 pages, SS12056. Named for U.S. General Omar Bradley, the armored M2/M3 Bradley Fighting Vehicle was designed to transport infantry or scouts and was possessed of sufficient firepower to suppress enemy troops and armored vehicles. Introduced into U.S. military service in 1981 the vehicle was built around the formidable Bushmaster 25mm chain gun mounted in the vehicle’s two-man turret. The vehicle’s three-man crew (commander, gunner, driver) was augmented by the ability to carry an infantry team of seven soldiers in the rear compartment protected by aluminum-alloy armored skin. Powered by a Cummins Diesel V-8 engine, the Bradley had tremendous automotive performance as well. The M2 Infantry Fighting Vehicle has a crew of three and transports a six-man infantry squad. 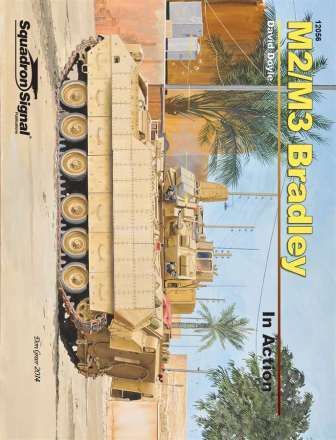 The M3 Cavalry Fighting Vehicle originally to be named after General Jacob Devers, but ultimately retaining the Bradley name, also has a crew of three, but carries only a two-man scout team. Improvements in armament used on the Bradleys, such as the TOW and TOW2, are also covered in the volume, whose 80 pages are packed with over 130 photos.